Due to popular demand, I will be taking cake orders as long as my schedule permits. 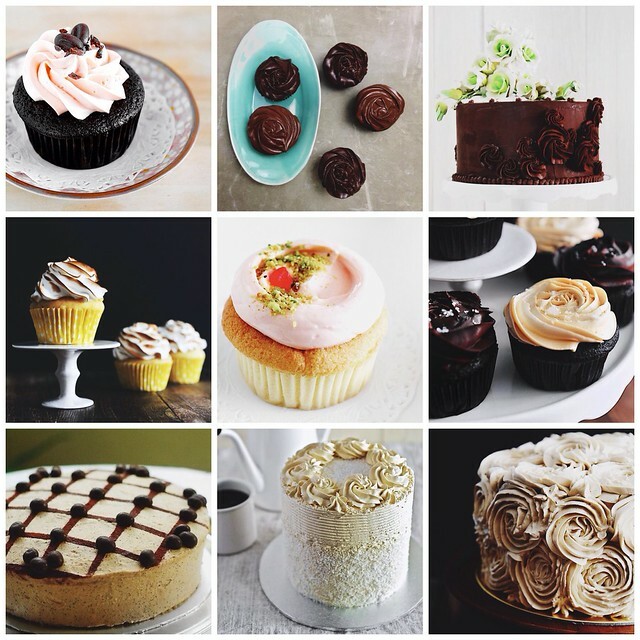 Almost the entire list of cake and cupcake recipes shared on Life is Great is available. 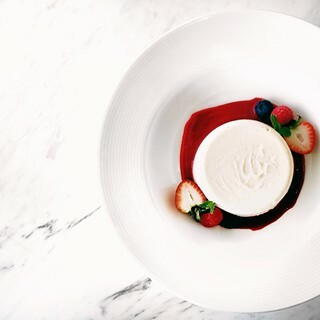 Top quality ingredients are used for your pleasure - Valrhona chocolate and cocoa powder, French butter, fresh cream, organic milk, pure vanilla extract, fresh fruits and berries - with no artificial flavoring, food coloring (unless insisted or in Red Velvet cakes) or commercial stabilizers such as ovalette. Email me your orders, terms and conditions apply. Salted Caramel Chocolate Fudge Cake - SGD 50 per kg. Dark chocolate cake layers, salted caramel buttercream filling, dark chocolate fudge frosting, sprinkled with top quality pure fleur de sel (hand-harvested sea salt). Sinfully decadent, perfect for salted caramel lovers. See inside of cake and list of ingredients here. Christmas Fruit Cake - SGD 60 per kg. Rum/brandy soaked dried fruits packed into an aromatic spiced cake, a seasonal favorite available all year long. Selection of dried fruits and/or nuts customization possible. See inside of cake and list of ingredients here. Lemon Layer Cake with 7-Minute Frosting - SGD 50 per kg. For lemon lovers, lemon cake layered with rich, tangy lemon curd, covered in peaks of dreamy white fat-free frosting, toasted to perfection. Cake cannot be chilled and must be served on the day of pick up/delivery. See inside of cake and list of ingredients here. Red Velvet Cake with Whipped Vanilla Frosting - SGD 50 per kg. Brick colored red velvet cake layers, filled and frosted with a soft, sweet whipped vanilla frosting. See inside of cake and list of ingredients here. Red Velvet Cake with Mascarpone Cream Cheese Frosting - SGD 60 per kg. Brick colored red velvet cake layers, filled and frosted with a silky smooth mascarpone frosting, a step up from the regular cream cheese option. See inside of cake and list of ingredients here. Chocolate Chiffon Cake - SGD 40 per cake (25cm). A substantial chiffon cake made with the best quality cocoa, garnished with dried cherries, chopped pistachio nuts and icing sugar. See inside of cake and list of ingredients here. Generra Cake with Sour Cream Chocolate Frosting - SGD 55 per kg. Inspired by the chocolate laced coffee drink, moist chocolate cake layers are spiked with concentrated top quality brewed espresso, filled and frosted with a soft, smooth dark chocolate sour cream frosting. See inside of cake and list of ingredients here. Yellow Cake with Sour Cream Chocolate Frosting - SGD 50 per kg. Perfect for birthdays for the young and old, classic yellow cake layers filled and frosted with dark chocolate sour cream frosting. See inside of cake and list of ingredients here. 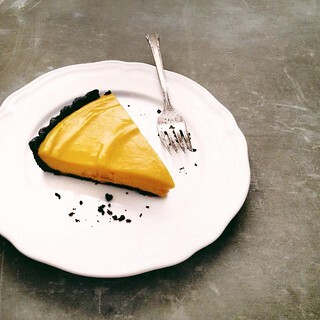 Chocolate Lemon Lime Cheesecake with Lime Curd - SGD 70 per kg. Chocolate Oreo cookie crust, lemon lime cheesecake filling, topped with smooth lime curd. Options to use Meyer lemon or yuzu when they are in season (price will differ). Minimum order of one whole cake. See inside of cake and list of ingredients here. Carrot Cake with Maple Cream Cheese Frosting - SGD 50 per kg. Layers of moist, spiced carrot cake filled and frosted with an incredible cream cheese frosting flavored with pure Grade A maple syrup. 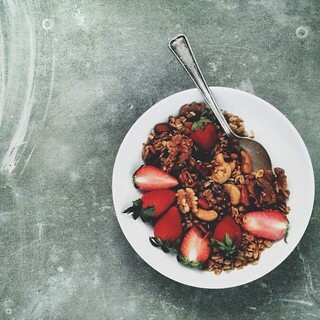 Options to add nuts and dried fruits available, price will differ accordingly. See inside of cake and list of ingredients here. 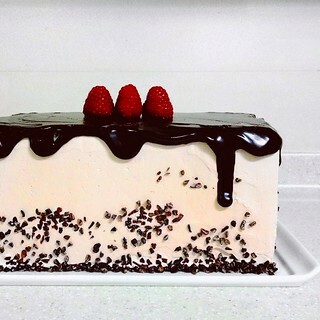 Dark Chocolate Raspberry Buttercream Cake with Chocolate Ganache Drizzle - SGD 60 per kg. Moist, dark chocolate cake layers filled and frosted with raspberry buttercream, with additional fresh raspberries tucked in between. Top of cake is covered with dark chocolate ganache drizzle and garnished with cacao nibs and, yes, more fresh raspberries. See inside of cake and list of ingredients here. Pandan Chiffon Cake - SGD 35 per cake (25cm). The classic favorite of every Malaysian and Singaporean. Made from 100% fresh pandan leaves extract and freshly squeezed coconut milk, without artificial coloring or flavoring. Minimum order of one whole cake. See inside of cake and list of ingredients here. Marble Butter Cake - SGD 55 per kg. Fluffy butter cake made with top quality French butter, marbled with dark chocolate portions derived from the best cocoa. See inside of cake and list of ingredients here. Citrus Chiffon Cake - SGD 35 per cake (25cm). Similar to the pandan chiffon cake, made with reduction of citrus of choice - orange, grapefruit, lemon or lime. Cake will appear neutral unless food coloring is used upon request. Minimum order of one whole cake. Cappuccino Fudge Cheesecake - SGD 85 per kg. The mother of all cheesecakes - for the chocolate, coffee and cheesecake lover. Full height Oreo chocolate cookie crust, a layer of dark chocolate ganache, smooth cream cheese filling flavored with freshly ground espresso beans, thin sour cream topping, decorated with more ganache and chocolate covered espresso beans. See inside of cake and list of ingredients here. Double Chocolate Cupcake with Raspberry Buttercream Frosting - SGD 3.50 per cupcake. Moist, dark double chocolate cake topped with Swiss meringue buttercream flavored with pure reduction of fresh raspberries. See list of ingredients here. Double Chocolate Cupcake with Chocolate Sour Cream/Chocolate Fudge Frosting - SGD 3.50 per cupcake. For the die-hard chocolate on chocolate fans. Moist, dark double chocolate cake topped with a choice of either sour cream chocolate or dark chocolate fudge frosting. Double Chocolate Layer Cake - SGD 60 per kg. Moist, dark double chocolate cake filled with homemade fresh raspberry jam for that refreshing tartness, frosted with dark chocolate ganache. The only double chocolate cake worth considering. See inside of cake and list of ingredients here. Lemon Meringue Cupcakes - SGD 3.50 per cupcake. Moist, zesty lemon cupcakes filled with homemade lemon curd, frosted with silky, shiny Italian meringue, torched to toasted perfection. A timeless classic. See list of ingredients here. Magnolia's Vanilla Cupcakes with Swiss Meringue Buttercream Frosting - SGD 3.00 per cupcake. That classic vanilla cupcake from Magnolia's Bakery, now available for your pleasure. Moist, flavorful vanilla cupcake topped with fluffy Swiss meringue buttercream. Options available to flavor buttercream frosting - lemon, raspberry, chocolate - price will differ accordingly. See list of ingredients here. Banana Chocolate Fudge Cupcakes - SGD 3.50 per cupcake. For those who love banana and chocolate together, this is the ultimate cupcake. Moist, chocolaty cupcakes spiked with sweet, ripe bananas, topped with a choice of either salted caramel buttercream or dark chocolate fudge frosting. See list of ingredients here. Tiramisu Cake - SGD 65 per kg. Adapting the classic tiramisu into cake form - sweet sponge cake layers moistened with rich espresso syrup, filled and frosted with espresso flavored mascarpone frosting, decked with a choice of chocolate chips or chocolate covered espresso beans. See inside of cake and list of ingredients here. Pandan Gula Melaka Layer Cake - SGD 50 per kg. The flavors of pandan, coconut milk and Gula Melaka merged, dubbed the Cendol cake. Moist, aromatic pandan cake layers, filled and frosted with Gula Melaka buttercream. See inside of cake and list of ingredients here. 1. 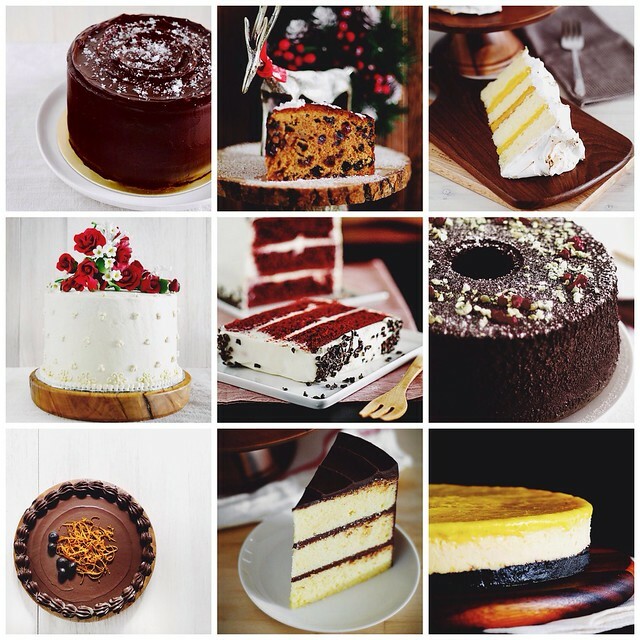 Minimum/Maximum Order - All whole cakes are charged by weight except for chiffon cakes and cupcakes. Minimum order is a full cake and frosting recipe, from 1.8 to 3 kilograms. 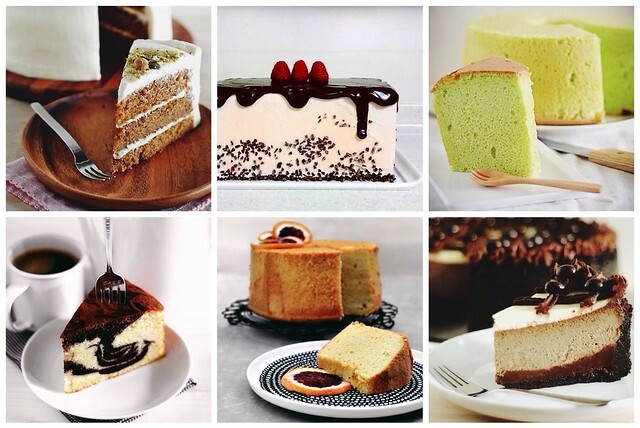 Minimum order for chiffon cakes is a whole 25cm cake. Minimum order for cupcakes is 24 cupcakes, maximum order 60 cupcakes. 2. Size - For whole frosted cakes: 1.8 - 2.2 kilograms = 3 layers 8-inch round, 2.2 - 3.0 kilograms = 3 layers 9-inch or 10-inch round. Square or rectangular cakes will be considered upon request. All cupcakes are standard muffin size. 3. Customization - Diet restrictions due to religious (halal) or nut allergy reasons can be considered, inquire when placing order. Gluten free and vegan options are not available. Decoration and ingredients for garnishes can also be customized. Price may differ depending on the level of difficulty and ingredients used. 4. Delivery/Pick-up - Since I don't drive, self pick-up is preferred. Delivery to MRT stations can be arranged. Any other delivery venue requiring cab will require the fare to be added to the price (cab receipt will be presented). 5. Packaging - For large and tall cakes requiring special hard boxes, additional charge of SGD 5 applies. This will be advised when order is placed. 6. Payment - Orders will only be made after payment is received via Bank Transfer, information to be provided upon order request by email. 7. Cancellation - Upon ordering and agreement of collection/delivery date, order preparation date will be advised. Cancellation can only be made at least 2 days prior to order preparation date. Payment made will be returned. If you have followed me long enough, you would know by now that I'm a perfectionist and wish to provide my clients the best experience. To ensure the quality, freshness and preserved deliciousness, all orders will be discussed in detail. You will know exactly what goes into your cakes and be advised on what is suitable for your occasion, taking into account the venue, activities and number of guest. Some cakes require more attention while transporting, keeping and serving. These too, will be advised before the final order is confirmed. Hi, are you still taking orders?